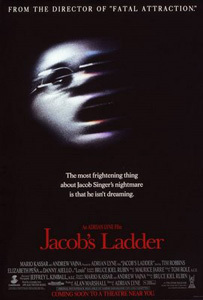 Jacob's Ladder is an incredibly beautiful and horrifying tale. It focuses on Jacob, a Vietnam veteran who simply can't shake the trauma of the war. He's a postal worker in New York but he sleepwalks through his life as increasingly intense and disturbing visions or flashbacks assault his senses. His tour of duty, his first marriage and even his dead son come to visit and it seems Jacob's life is unravelling. The film is brilliantly directed and Robbins is excellent as Jacob. This is a film that will have a real impact on you and you can expect it to leave a lasting impression.